About DataMap | DataMap Ltd.
DataMap Ltd. provides online office and mapping services for businesses. We run Geographic Information Systems which allow the editing of information in an online environment, providing a tool for revision and addition. The tools are vital for any business which has location-based activities or inventories. Examples of these activities range from mapping and managing hazards, providing management records, resource consents, store inventories or comparing sales figures. We can set up your own online office providing emails and mapping, as well as all other programs required by the business. 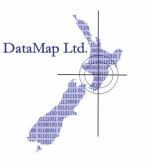 DataMap Ltd is hosted on a stand-alone NZ server, and allows integration with many services. The online maps may be public or private using a login; access may be direct, from another website, or from a Smartphone / QR code.